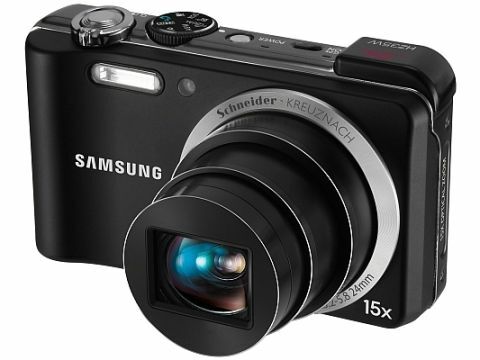 At first glance, the 12 megapixel Samsung WB600 doesn't look like a camera that particularly stands out from the crowd of mid-range compacts. It's built from plastic rather than a more exotic magnesium alloy, it isn't festooned with manual dials, and it isn't till you turn it on and start using the lens that you realise the trick it has up its sleeve – it's a truly enormous telephoto, backed up by a camera with enough options to keep long distance photographers happy. As Samsung's top-end compact, the WB600 has some pleasingly high-end features. The first is given away by the mode dial on the top of the camera. There's a fully automatic mode for point-and-click types, as well as a program mode that puts plenty of control in the photographer's hands without handing over aperture and shutter decisions. But there's also an A-S-M mode, which allows you to set your own aperture or shutter, while the 'M' stands for manual, allowing you to set an entirely custom exposure. In use the system works reasonably well. Actually changing the camera's settings requires you to dig into the menu system - another dial for flicking values up and down would have been an excellent inclusion - but it doesn't take too long to get things set as you want. The 3-inch LCD simulates the exposure your settings will result in, which is handy if you're not sure what you've done will result in a good image. Otherwise, the WB600's build is good. It's an all-plastic construction but feels tough, and while the 3in display isn't as fine-grained as you'll find on some other Samsung cameras (not least the superb AMOLED display on the Samsung EX1), it's a decent model, if a touch hard to read in the sun. But if the WB600 is a little bulky compared to some, it's worth remembering that it's got one of the longest lenses of any compact built-in. The 15x zoom lens housed in the 2.8cm deep body is equivalent to 24-360mm in 35mm terms. That's truly telephoto, although it's also long enough to make the optical image stabilisation a real necessity. It's so long, in fact, that the motor that drives the zoom mechanism becomes an issue when you want to go from wide-angle to telephoto quickly: with a wide-to-long time of 3.3 seconds, getting the composition you want takes a little patience.